You might be wondering why we're just making this page now, in December of 2007. Well, maybe it's been happening for years and we just weren't aware of it here, but in the past few months we've seen a lot of stolen lightmaps showing up in repaints at avsim. What do we mean by "stolen"? We mean lightmaps that were made by someone else for their repaint, being taken without permission and used by a different painter for a repaint other than the one it was originally uploaded with. How can you tell a lightmap is stolen? Well, sometimes it's quite obvious because the original painter either put his name on the lightmap, or the name of the specific airline repaint it was made for, or both. Other times you can tell when the repaint was uploaded in December 2007, but the included lightmap was made in July 2004. And sometimes it's quite obvious something's wrong with the lightmap when you see an aircraft taxi by you at night and the window shades or fuselage where a window was plugged are being lit up by the lightmap. So, we thought perhaps the reason for this was something other than laziness, perhaps it was because people don't know how to make a lightmap. Well in truth, making a lightmap is a lot easier than making a repaint, and shouldn't take you more than 10 minutes at most to create. So we made this page to walk you through the steps in making a lightmap. This tutorial is made with the assumption that the painter is using Photoshop as their paint program, but it should work as well with other paint applications more complex than MS Paint. What can happen when you use/steal a lightmap that wasn't made for your repaint? Here are some examples of what can happen when a repaint uses a lightmap that wasn't made for the specific repaint they were included with. 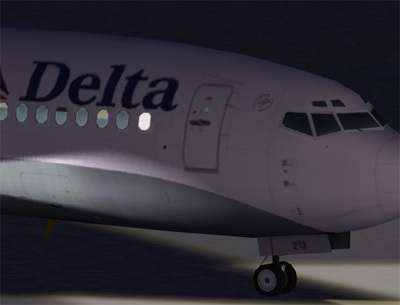 Here you see closed windows shades being illuminated at night by a lightmap taken from some other repaint. Often painters will create their own customized window shade arrangement and make a customized lightmap for it. That's what you're seeing here. Here are more closed windows shades being lit up at night as well as the fuselage being illuminated where a window was plugged on the repaint. And more of the same. White fuselages will light up much brighter than the blue gray of the windows and will stand out like a sore thumb at night. Why a painter would want to spend hours on a repaint and then just steal someone else's lightmap and then not even look at it before uploading is beyond us, but we've seen quite a few repaints like this at avsim over the past few months. So, how do you make a lightmap specific for your repaint? It's quite easy actually, but one of the reasons we suspect that people may be wary of making lightmaps is because lightmaps also use an alpha channel to turn the landing light splash on the fuselage on or off independent of the rest of the lights or lit windows. Alpha channels can be tricky to work with if you don't understand them, but for making a lightmap (at least using an AIA lightmap paintkit) the alpha has already been taken care of, and you don't have to worry about it at all. 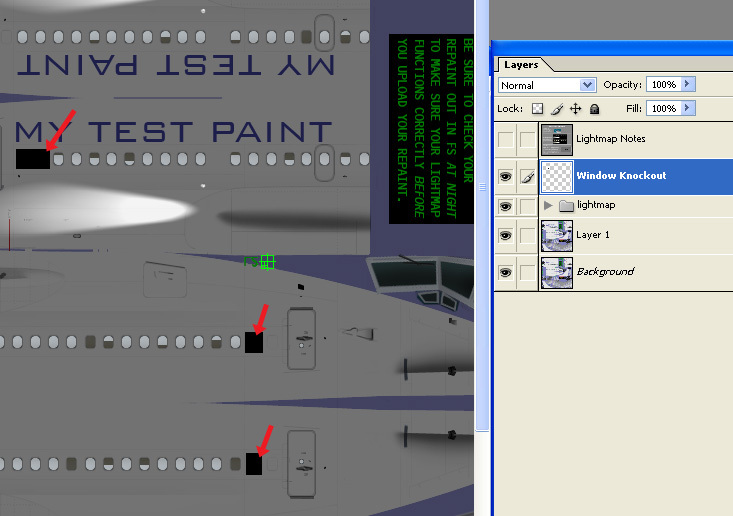 This is just what it sounds like, you're painting the texture that people will see on your airplane. To make the lightmap creation easier, just use the provided window shade arrangement as that is what the lightmap that came with the paintkit was made for. In our example we're going to assume that the airline in question plugged some of the windows on their aircraft. This is quite common in the airline industry. If you were to just take a lightmap from someone else's repaint there's a very good chance that some of your plugged windows are going to be illuminated at night. Once you've finished your repaint, save it as a .bmp. You will need this anyway for converting it to the DXT format so that FS can see it, but in the meantime, we'll use it as a background image while making the lightmap. 2. Open up the lightmap PSD. In order to be able to see the bmp of your repaint we'll need to reduce the opacity of this. In this example, all the pieces making up the lightmap are contained within a folder/selection set called "lightmap". There's no need to open that set up, just select it and lower the opacity to 40 or 50%. Now you can see the background layer beneath the lightmap. Your plugged windows are pretty obvious now. They will show up much brighter than the adjacent windows. So, what we need to do is to knock them out. 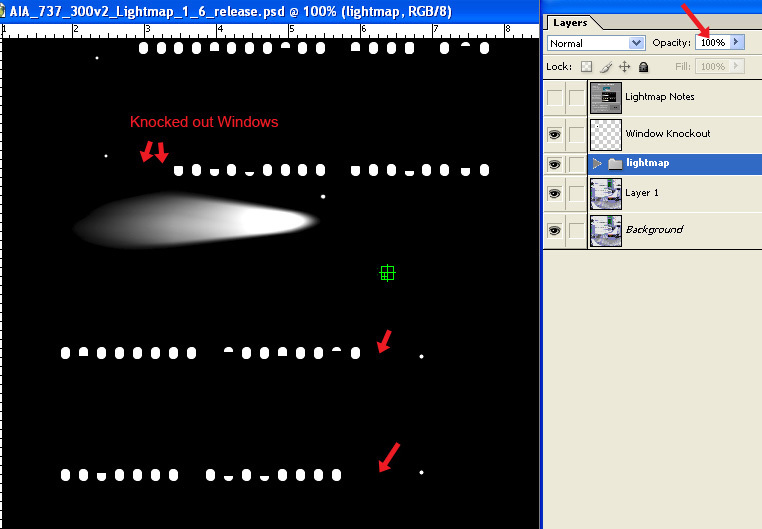 This particular lightmap paintkit already has an empty layer called "Window Knockout". If your paintkit doesn't have one, you can just add a layer above all the layers that make up the lightmap. 4. Knock out those windows! If you want, put your name on the lightmap, or the airline repaint you've made it for. This way you can see if someone steals it from your repaint one day. More immediately though, it makes it easy when you're converting to DXT to make sure you've actually loaded the correct lightmap, because lightmaps pretty much all look the same. Just be sure that whatever you add as identification is over the blank areas of the texture, and not across any of the parts that are going to show up on the model. 5. Make the lightmap 100% opaque again. 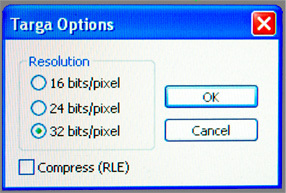 You need to choose 32 bit. 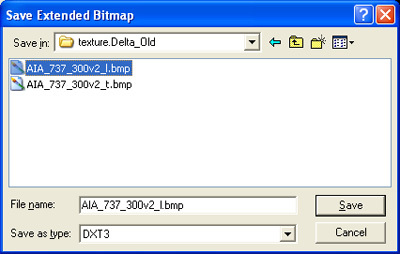 32 bit is needed because of the alpha channel we discussed earlier, but that you never saw while making your lightmap. If you put the repaint name on your lightmap as mentioned earlier, make sure you see it here. Our airline name just happens to be "LIGHTMAP 1.6", so everything is good. Also, glance up at the upper right where it's displaying the alpha channel and make sure it's there. As long as you see some black and white areas, the alpha channel is OK and you don't need to worry about it. Well, that's all there is to making a lightmap, we hope we've removed some of the unknowns from making a lightmap, and that you'll never glance at someone else's lightmap again and think of just "borrowing" it for your repaint. 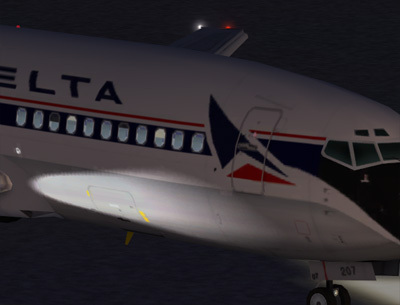 *Like this old Delta Airlines paint. Delta's 737-300's don't really have logo lights on the tail.